In November 2017, the U.S. Department of Justice filed lawsuits to revoke the U.S. citizenship of five immigrants who concealed in their naturalization applications that they pleaded guilty to sexually abusing minors in incidents said to occur before they were naturalized. Amid a federal crackdown on immigrants, the lawsuits raise questions of whether and when can a person’s citizenship be revoked. The 14th Amendment of the U.S. Constitution, adopted in 1868, provides the foundation for the rights of citizenship. It says, “all persons born or naturalized in the United States and subject to the jurisdiction thereof, are citizens of the United States and of the State wherein they reside.” The U.S. Supreme Court has allowed citizenship for naturalized citizens to be stripped, but only in special cases. Adopted shortly after the Civil War, the 14th Amendment gave citizenship to former slaves who were born in the United States and essentially established that the citizenship of those born in the U.S. could not be revoked by Congress or the government for any reason. Nearly a century later in 1967, the U.S. Supreme Court expressed the sanctity of the 14th Amendment on citizenship matters in Afroyim v. Rusk, an expatriation case. 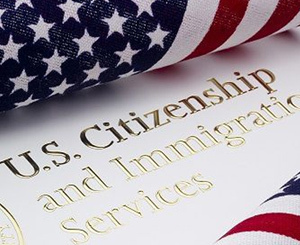 The U.S. Citizen and Immigration Services defines “a citizen at birth” as an individual born in the U.S. or certain territories or, if born abroad, born to a parent or parents who were citizens at the time of one’s birth who meet certain statutory conditions. Immigrants who pursue naturalization to become citizens are typically required to take a test on English and U.S. history and government. The U.S. Supreme Court decision that gives the Justice Department its most solid footing in its suits of last November is Fedorenko v. United States, a 1981 case involving an immigrant who entered the U.S. under the Displaced Persons Act of 1948, which fast-tracked the admission of 200,000 European displaced persons for permanent residence. The Supreme Court found that Feodor Fedorenko, who had served as a guard in a Nazi concentration camp at Treblinka during World War II, made a “material misrepresentation” in his application, making his 1970 citizenship “illegally procured.” He was later ordered deported, and the case became a precedent to revoke the citizenship of others who did not disclose their Nazi ties. Denaturalization, as the process of revoking citizenship is called, is rare. U.S. Immigration and Naturalization rules state that “discovery that a person failed to comply with any of the requirements for naturalization at the time the person became a U.S. citizen renders his or her naturalization illegally procured.” There is also a fast-track naturalization process through U.S. military service, and citizenship can be revoked if a soldier is discharged for less-than-honorable reasons and has not served five years. Denaturalization proceedings are conducted by federal courts. In a June 2017 decision, Maslenjak v. United States, the U.S. Supreme Court set a high bar for the federal government to revoke naturalized citizenship. In oral arguments two months earlier, the Trump administration contended that any violation of law should be disclosed in a naturalization application, and any deception, however trivial, could expose the applicant to denaturalization. The case involved an ethnic Serb who lived in Bosnia during the 1990s, was naturalized and later admitted lying on her husband’s application for citizenship though not on her own application. “I drove 60 miles an hour in a 55-mile-an-hour zone,” Chief Justice John Roberts told the government attorney in oral argument, adding that he had not been caught. “If I answer that question no, 20 years after I was naturalized as a citizen, you can knock on my door and say, ‘Guess what, you’re not an American citizen after all’?” Roberts asked. The Justice Department lawyer said the offense should have been disclosed. “Oh, come on,” Roberts responded, before asking again whether someone’s citizenship could turn on such an omission. “If we can prove that you deliberately lied in answering that question, then yes,” the government lawyer replied. The Supreme Court was not persuaded, rejecting the government’s broad view of misrepresentation. In a 9-0 decision, the court ruled that any untrue statements need to be material to that individual’s citizenship application for denaturalization to occur.